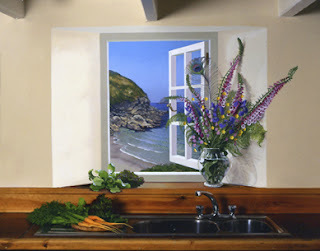 French for 'fool the eye', trompe l'oeil paintings and murals have been used since Roman times to give the illusion of a bigger room through scenes with distance perspective.If you can't paint or hire a muralist, a graphics shop can blow up the scene you want. if you happen to know a shop like that here in hk, please let me know. thanks! Good thing i can paint, errrr, but i dont want dat "trompe l'oeil", seems mushy, hehehe.